Did you know? 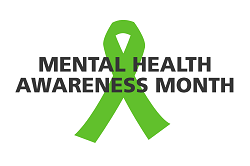 May is National Mental Health Awareness Month! What is mental health? It is the way your thoughts, feelings, and behaviors affect your life. Good mental health leads to positive self-image and in turn, satisfying relationships with friends and others. Having good mental health helps you make good decisions and deal with life’s challenges at home, work, or school (American Psychological Association). However, a whole month dedicated to being aware of mental health? YES! As Americans, we tend to be self-reliant, problem-solving enterprising people. Great for managing a career, a home, or post-secondary education. We get sick or injured; we get fixed-up and move on with our lives. Nobody would think twice about getting help to fix a broken bone or get medicine for pneumonia, would they? Would you? What about getting help when you have experienced a loss of a loved one, a pet, or a job? Or when you mentally hit a wall and can’t think straight because you have been working non-stop for several days plus managing (trying to) a personal life? That is like being mired in a mental muck with no obvious way to help yourself. You try and try and it seems as if the mental muck keeps sucking your life force away. You begin to feel desperate, overwhelmed, and not hopeful. Soon, your work-life/school-life/home-life begins to deteriorate, chunks of “you” break-off and the only things which seem to provide relief are sleep, isolation, and sometimes, high-risk behaviors. It is a dark, downward spiral. There is help! In El Paso County, the National Alliance on Mental Illness (NAMI), Colorado Springs chapter offers free of cost classes and support groups for individuals, family members and others to help you understand the complexities of different mental illnesses, learn how to access resources, and most importantly, connect with others who have shared experiences. As many resources are available online, it’s important to remember that taking care of your mental illness requires medical attention as any other physical illness. Talking to your primary doctor can be the first step if you think you or someone you love suffers of mental illness. Seeking a psychiatrist and/or a therapist is a crucial next step, as mental illness requires specialized training for proper medication and therapy. Ultimately, self-care: exercising regularly, eating healthy meals, taking the medication, and sustaining a healthy social life are all important when addressing mental health. If you or a loved one might experience mental illness and you are not sure what to do, you should talk about it with your primary doctor. Reach out to NAMI Colorado Springs by calling them at 719-473-8477. For a crisis situation, you can call the Colorado Crisis and Support Line 844-493-8255. To learn more about Mental Health Month visit the Mental Health America.